Need to do a quick check on my availability? 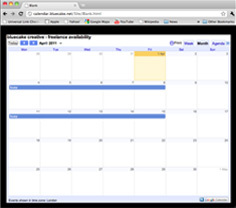 Click on the image above to go to my Google calendar. This should give you a good idea if I'm available when you need me. Even if I'm shown as busy, give me a call, it may be a provisional booking or something I can change.